Home / Unlabelled / Har Ki Dun in July: Joy extended till October!!! Har Ki Dun in July: Joy extended till October!!! It's been months already and I just can’t seem to escape from the sounds of the rustling river and the tranquility amidst the woods. Even the vile honk of a bus or the sharp horn from my own bike, takes me back to Har ki Dun. Har Ki Dun, translated means the valley of Shiva, has a surreal vibe, like it is the end of nowhere or the beginning of something. 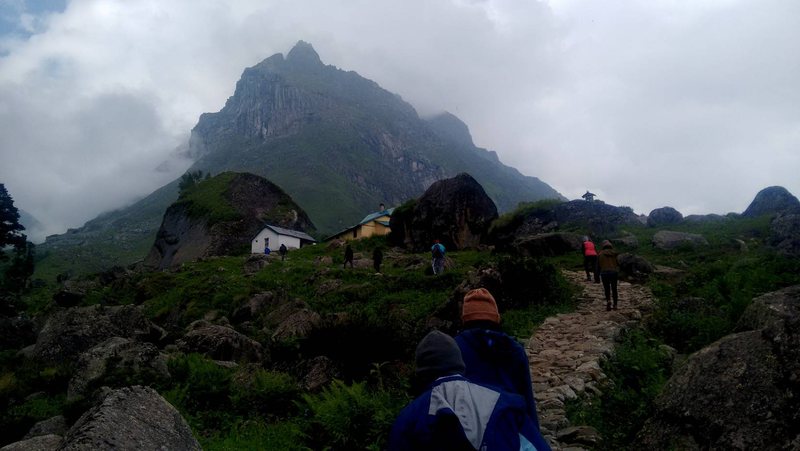 Enclasped by magnificent snow capped peaks, coniferous pines, small shrines of Shiva, a river laced with ice shreds, all under a million stars of the Milky Way in the night, Har Ki Dun was perhaps nature’s best resort and trek to get there was a magnificent journey! A fairly challenging one, Har Ki Dun in marked as a moderately difficult trek on the maps, but that could probably be a result of how it balances challenges with experience and scenic advantages? Regardless, thinking about it now, it felt like a smooth, relaxing, yet venturing trek. What a package! We started on a beautiful Saturday. The vibe was delightfully contagious and our excitement was obvious. Delhi greeted us with warm, but humid weather, which came as a welcoming surprise as we had expected rains through the day. Boarding the metro and sketching out a plan en route, we reached Connaught Palace looking for a place to lunch. After almost an hour of research, our growling tummies took us to Kake Da Hotel where we had to wait for another twenty minutes. There was whining, and a very long wait, but oh was it worth it! All of the food is cooked in the anterior of the hotel which made the wait only that much harder! There were aromas of melting ghee, roasted spices, grilling meat and that sizzling sound of a dozen pans! This tiny, but popular place, which seats on the first floor, served some of the best parathas, butter chicken and paneer. Our train was scheduled to leave at 10 PM and with more time to kill, we headed to India Gate. Not so touristy, but we laid down on the lawn and looked around the Capital with a different perspective- a more relaxing one. 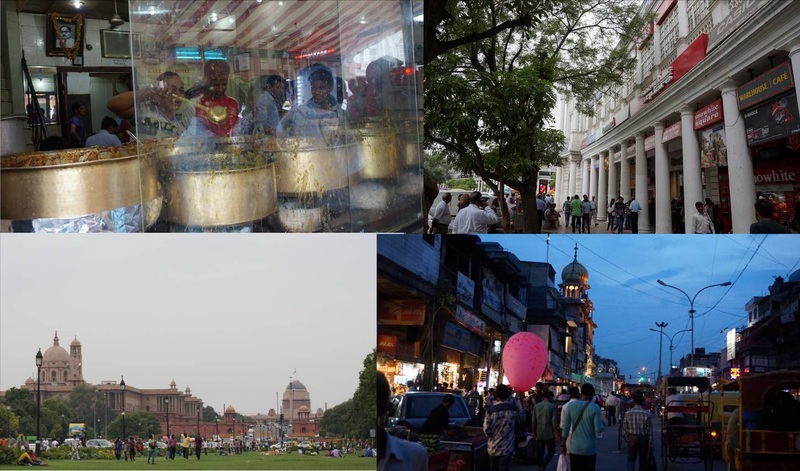 Our next stop was Red Fort, but honestly speaking, it was the journey around that was more exciting! Squeezing through the chaotic traffic packed with rickshaws, frustrated riders, half of the troop headed to Parantha Galli to pack us some dinner. Stuffed paranthas deep fried in Ghee accompanied with pickled radishes and chutney, made fresh, amidst the hustle and bustle of the market. The only "calming" sight in this market was the dog that napped like it was nobody's business! On the other end there were exceptionally skilled riders honking senselessly, tensed businessmen who managed to smile anyway, tangled wires perhaps a symbolism of everything around- the contrasts! Dinner packed, it was time to board the train and head to Doon. Dehradoon was just waking up when we reached. 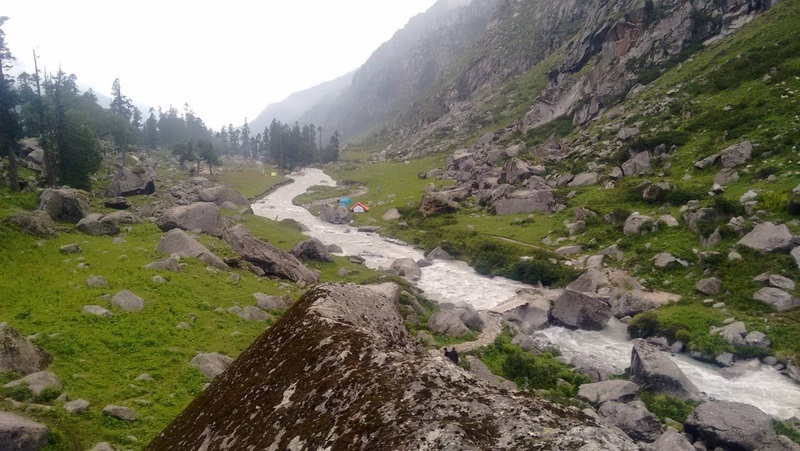 It was like walking straight into the pages of a Ruskin Bond novel- lucky we reached early. The weather was perfect, with dew drops still lingering in the air. Since tempo travellers refused to drive to Sankhri- our base camp- due to the apparent landslides, we had to take two MUVs. We drove through Dehradoon and headed towards Mussoorie. Noticing some beautiful mountains, shrouded in evergreen trees and capped with layered clouds, excitement was evident. For a second we didn’t think of what is ahead for us. The morning doze of nature was breathtaking, but the meandering roads, the hairpin curves, ugh- not so great for some! Regardless, we were all just lost in our own thoughts admiring the route. Post lunch began the most breathtaking, scenic road trip. The evergreen conifers, the roaring Yamuna, the clear blue sky- what a view! It didn’t stop there, we were greeted by apple orchards on either side of the path, through roads paved with shingles! It was amazing. Our stay at Sankhri that night was at this little motel, with views that were beyond astounding. We also made friends with the most adorable canines, Bolu, Buddhu and Raja (who was christened Akira later). 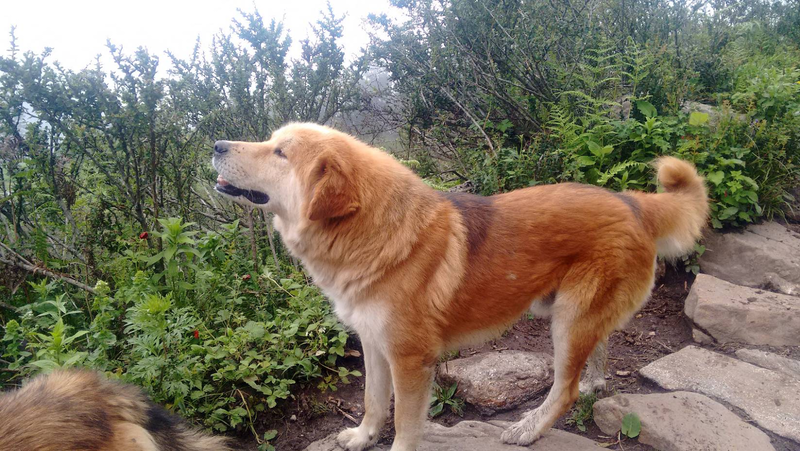 These canines were like the St Bernard’s of the Himalayas- loyal, friendly, ever ready to help and born trekkers! 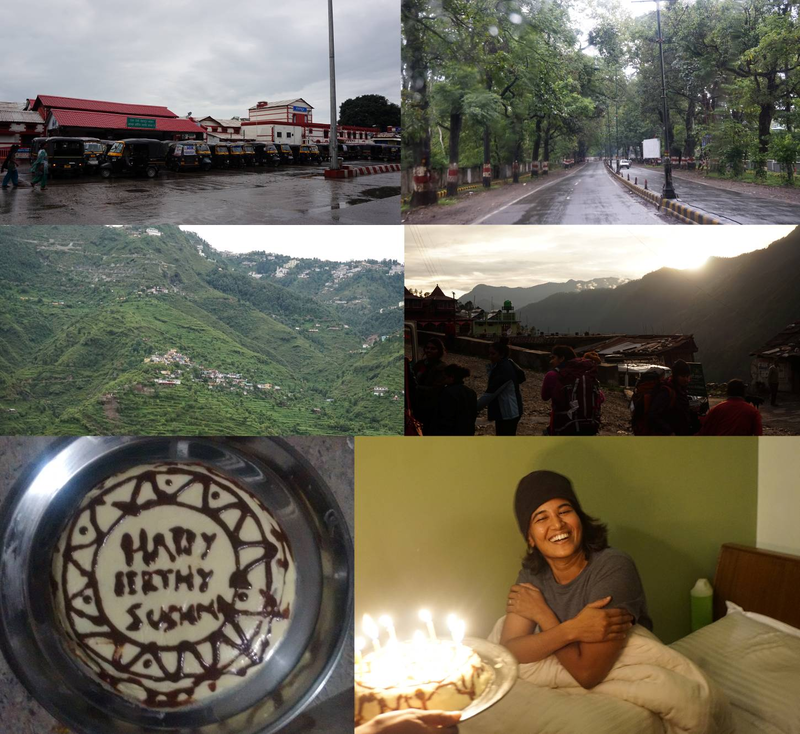 After a brief session with our trek leader Neil Bhutha (a 21 year old Mumbai native, a mountaineer, a dancer, a DJ, a benevolent person, an amazing story teller and a brilliant trek leader), plans were being made to surprise Sushma on her birthday that night. We arranged for an apple cake but also had a plum cake (courtesy: Akash). We continued to play at the dining area while Sushma was busy in her room. At the midnight hour, we all barged into her room, making her jump off her bed, singing “happy birthday”. The look on her face- priceless! She claims this to be her best birthday ever! We began at around 8 am, with lighter backpacks and flexed muscles. The route here were so perfectly paved, it was almost like viewing different wallpapers with each step you take. Nimbus and Akira, our loyal guides, made this view better! Our first challenge came when we had to cross a creek. Well, the challenge was really to brace the ice-cold water and the gushing force of the waterfall. Neil took the lead, we knotted each other’s hands, and stepped side ways while each one of us wailed in joy and pain as that piercingly cold water tingled our feet! It took us 3-5 minutes to cross the creek, but watching Akira and Nimbus cross the creek with such ease it made us go- eh! In all honesty, our trek on the first day was not as tough as we thought it would be. Or, I guess our first look at Taluka and its fairy tale charm just relieved us of all our exhaustion. Taluka, a small village about the size of MG road houses a few families of grazers and farmers. The people here are still so naïve, like the Amish, there is so much innocence in their smiles, exuding goodness and honesty, making them great hosts. Taluka has a few concrete houses, although the few wood ones helped retain the village’s charm, despite their thriving greed for development. For most of the evening after we arrived, we ended up resting in the balcony, feet up on the railing, breathing in the view of the small pond, the apple orchards and the wood houses on the hillocks. Meanwhile, Neil’s crew had set up their kitchen and dining tent and were already prepping for lunch and dinner. 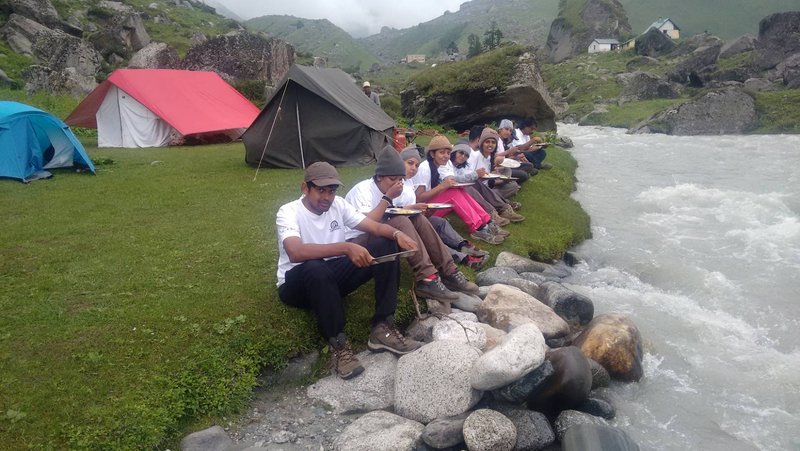 The food, believe me, was meant for a king and not a trekker! The head chef Rahul (He is 18 and cooks like a masterchef!) and his sous-chef Jogindher (who is a poet) outdid themselves, serving us a variety of lentils, salads, soft and hot rotis, fluffy basmati rice, a sweet, a different stir fry everyday, soups, pancakes, French toasts, pasta- these boys were skilled! It rained heavily the previous night and the sky was absolutely pristine that morning. It was motivating, almost like nature calling us to reach our summit soon. After a healthy breakfast, we started our journey and the crew loaded their luggage on the mules. The paths meandered through the forests alongside river Supin, with inexplicably comforting music from the swaying trees, the chirping birds and the chanting river. 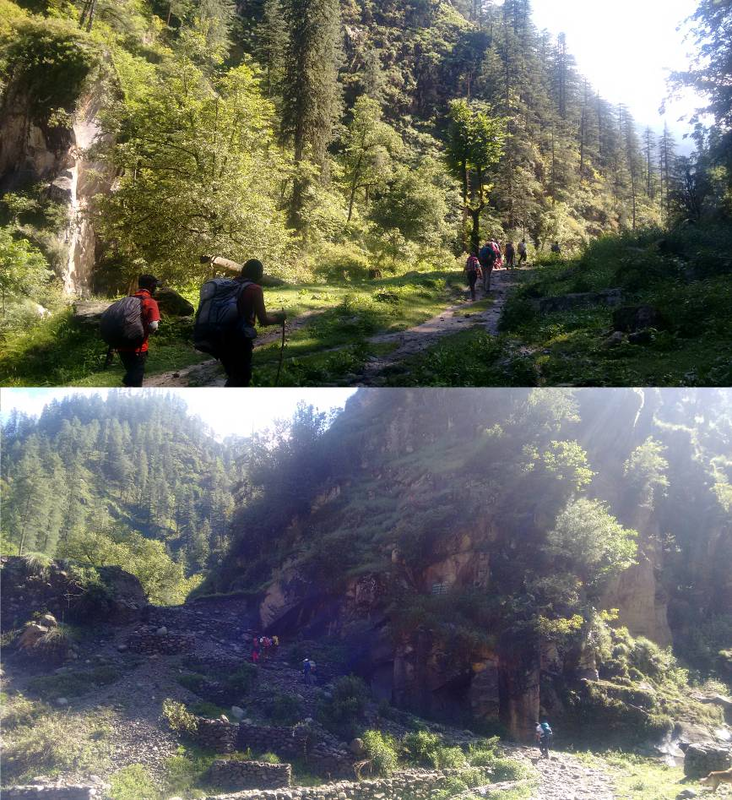 It was every trekker to him/herself as we paced through the lush greens of the Gharwal Himalayas. Vijay, our other guide was an uber positive person, who encouraged us to greet every villager who passed by. Our greetings acknowledged with a shy smile or a big one with creases along the eye. We stopped for lunch at Gangaad, another beautiful village with wood houses, terrace rice farms and the glistening sun just made it better. 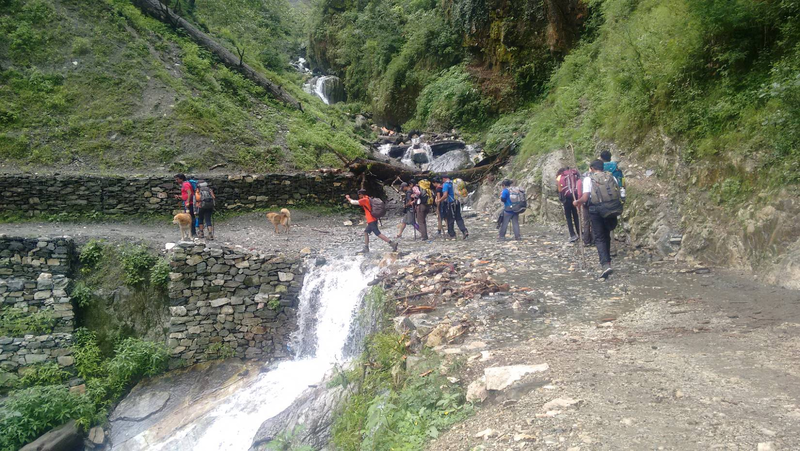 Despite the heat, all our water sources rendered ice-cold fresh Himalayan water and boy, was that a relief! Continuing, we headed to Osla. Passing through the rugged paths paved with stones, we were pumped as this was our first “rough” path. A kilometer ahead, we could spot Osla, somewhere mid mountains. It looked picturesque and we already felt a sense of achievement, thinking we already made it. But, little did we know, the trek had just begun. It was like one of the moments where your destination is right in front of your eyes, but you walk and walk and it keeps getting farther away! Oh, and not to forget, it felt like this mountain was inclined at an 60 degree angle, sheesh, and the path you ask? only stones! 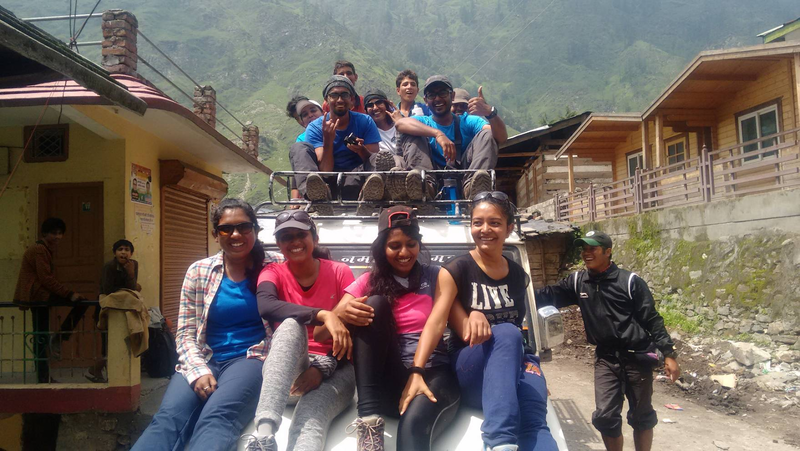 Our only source of motivation were Shwetha, Shrish and Sudesh. Pretty sure we had the same lunch, but they literally ran up the mountain along with the mules and the team, who walked like they were taking a stroll in the park! A long hour (of snacking a local fruit called chillu while gasping for breath) later, with our organs jutting out because of the exhaustion, we reached to see the trio cheering for us. Osla’s kids were also the first to greet us with smiles and pleas for candies! When we settled in our log cabins, the pain that rose from the feet to every inch of the back was like our trophy, it gave us a sense of accomplishment especially when we were told this was the toughest path. The rest of the evening in tranquil Osla was spent attending Neil's backpacking session, strolling around the village and enjoying the rains with hot tea and silly conversations. That night, it rained cats and dogs. 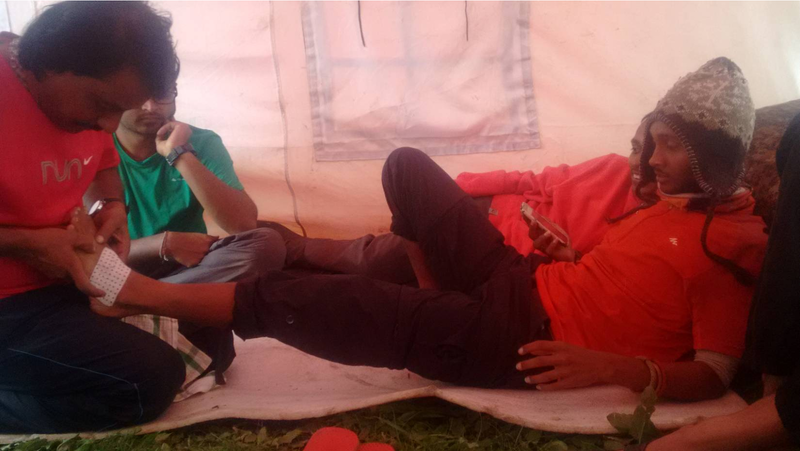 While half of us were worried about the next days trek, some of us just took advantage of the rain's rhythm and dozed. At around 1 in the morning, some of the girls woke up midnight after realising we were given a room with a leaking roof! We panicked for a good ten minutes, pushing all our clothes and rucksack to one corner, flashing lights at each other to check if it was all ok. Finally, we decided to go bunk with the rest of the team and that night, there were 12 of us packed in a 20X20 log cabin with almost no windows! Regardless, we got a good nights sleep, enough to energize us for the next day. Taking blessings from a Pagoda styled Shiva temple in the village (Nope, this is not the infamous Duryodhana temple you might have heard of. Turns out it is a Shiva temple that was largely misunderstood by tourists. Another version unfolds that the villagers lied that it was a Shiva temple only to protect the temple installed for someone with so many misdeeds), we bid aideu to the lovely folks of Osla to head to Har Ki Dun. It was a chilly day but the sun peeked every now and then. More sights of Amish lifestyles around, we got a chance to closely observe the working of a Pani ka Gharat. 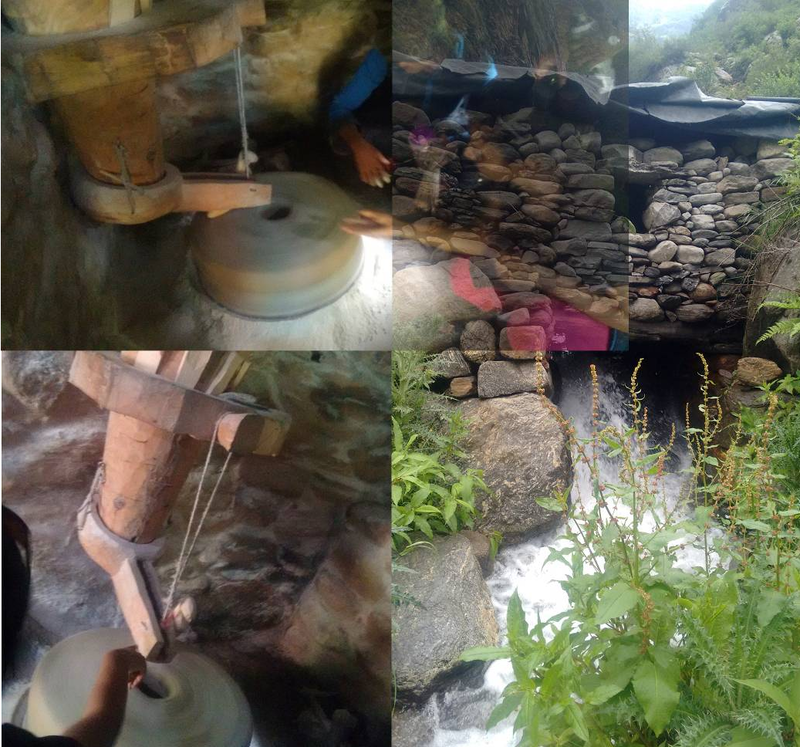 What it is is a flour mill (chakki) that works on kinetic energy generated by a waterfall. Similar to the manual flour mills we have here-a two tiered one- it is enclosed in a little shed at the foot of a waterfall, where the top tier of the mill rotates when the gushing force of the waterfall pivots a lever attached to it. In a few hours, the wheat grown organically in the fields a few metres away if processed to make the freshest and most nutritious flour there is. We had to trek down a few metres, jump from rock to rock, to see how it works and smell fresh wheat and stand in the stuffy shed. We went back a few decades in here! The most amazing part of this route was the visual treats with every step we took. There were beautiful mountains everywhere, a gushing river at the foothills, streams of waterfalls on every peak and at a distance, a beautiful snow capped mountain that teased us, hiding itself behind clouds every few minutes. Most of us had well packed backpacks post Neil's session, making it slightly better for us as we braced the chilly wind. True, it started with sunshines and butterflies and in a just a few minutes as we ascended the mountain, a gush of cold wind started to hit us as we walked through the fields of Himalayan flowers. Cold wind or not, we just continued to enjoy the scenic beauty around. A few hours after, we settled at a beautiful spot for lunch. Admiring a 20 ft high waterfall, sitting on a log sheltered by a shack, we had delicious pulav with some local pickles of lemon, lotus and mixed fruits. It surely was chilly, but there comfort in the sound of the waterfall. 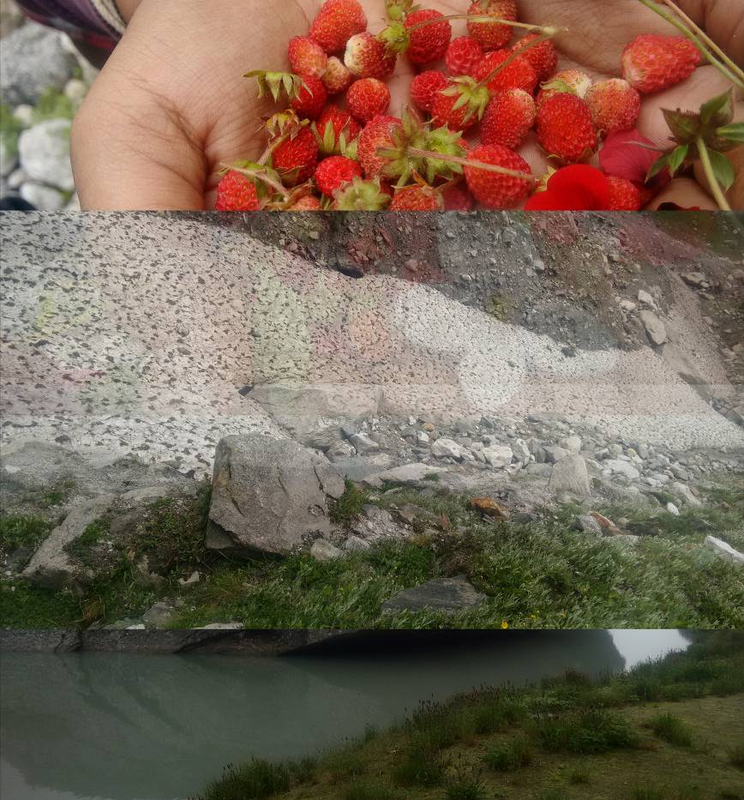 Trekking further, we passed some bridges where the echo of the gushing water was enthralling and foraged to get our hands on some delicious wild strawberries. Our second stop was at Kalkatti Dhar, a meadow covered in lush green carpets with sights of coniferous forests around. We had already begun chanting "we're almost there" as our guides gave us ambiguous clues of our exact progress. In just a few minutes, the scenes changed from bright meadows to pine-trees shadowed paths and back to bright meadows and there we were- our summit- HAR KI DUN! At the beginning of the valley was a small boulder that was adorned with a tiny sanctum sanctorum, said to be that of Lord Shiva. We stood there for a while as we cheered and celebrated and as we spotted our tents, there were heavy and happy sighs. Digesting the fact that we would be staying at the spot, right by the river just got our spirits higher. 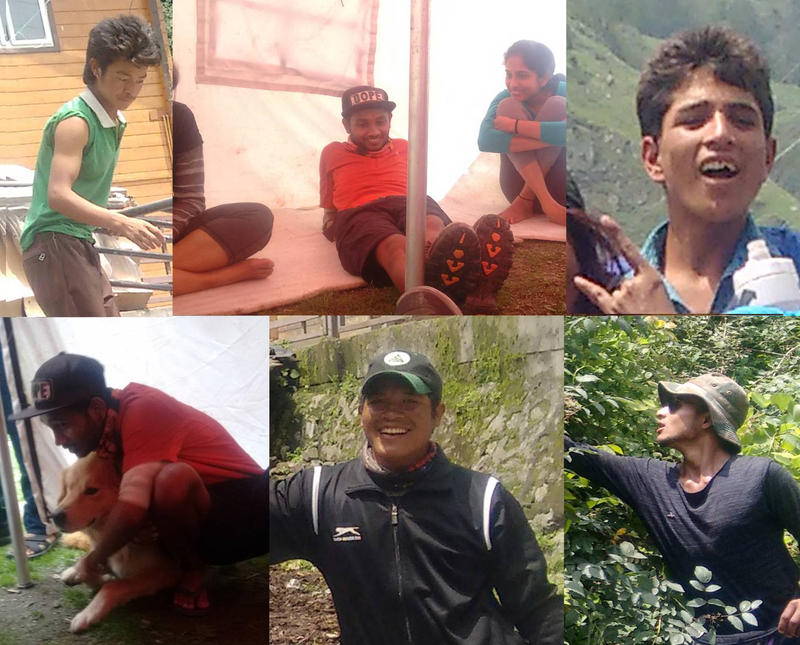 There was an immediate photo session, fashioning in our name tagged, custom made shirts for the trek. And believe me, the shirts were on only for a couple of minutes, as soon as the cameras slid into their respective pockets, the coats were back on! For some, it was surprisingly not as cold as expected, but I guess it was just the overwhelming joy that was warming us inside! A quick refresher and a bowl of hot maggi later, we headed to a spot a few metres ahead where we got the perfect view of the peak. The spot was everyone's favourite for the next few days. Why you may ask.. There was the Har Ki Dun peak on the left, picturesque view of meadows and the Yamuna river in the front, further left was the Haatha peak and straight ahead was the magnificent Swargarohini and somewhere in the background, Kaalanag and Bandarpoonch. On the right, a hillock with an idol of Shiva and a band of sheep grazing throughout the day. Further right, our camp site and right behind us was a guest house. All this together gave us a reason to just sit ideally for hours waiting for Swargarohini to show its beautiful self. As it got chillier, the layers of clothing piled on, but we managed to click more pictures, talk to the couple of locals around, meet more dogs and enjoy the good food Rahul made for us. It was an early night in, but an adventurous one! If mornings were like it was in Har Ki Dun, everyone would be a morning person! 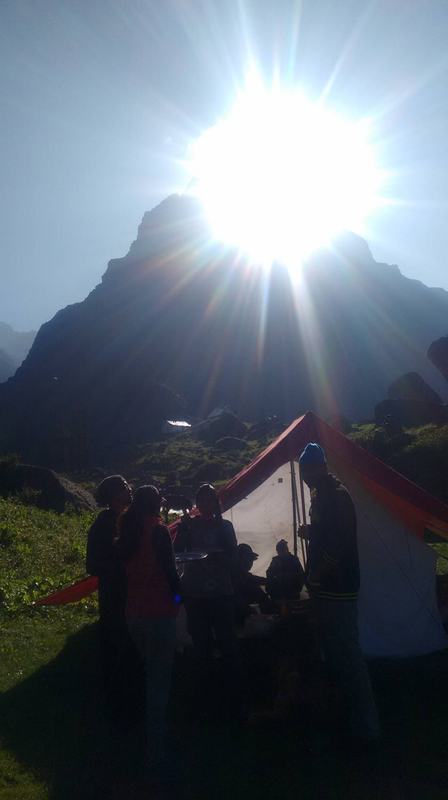 Up at around 5:30, we were out our tents to get some vitamin D and get quick looks of sun rays emerge from the mountain. They were perfect, equally spaced sun rays cresting Hatha* peak and illuminating Swargrohini on the other side. Oh, that view! We rushed to the spot again and spent a good half hour absorbing all the beauty. The initial plan was to trek to Jaundhar glacier on the second day, but we learnt that the glacier had moved 3 kms farther (Global warming, eh?) 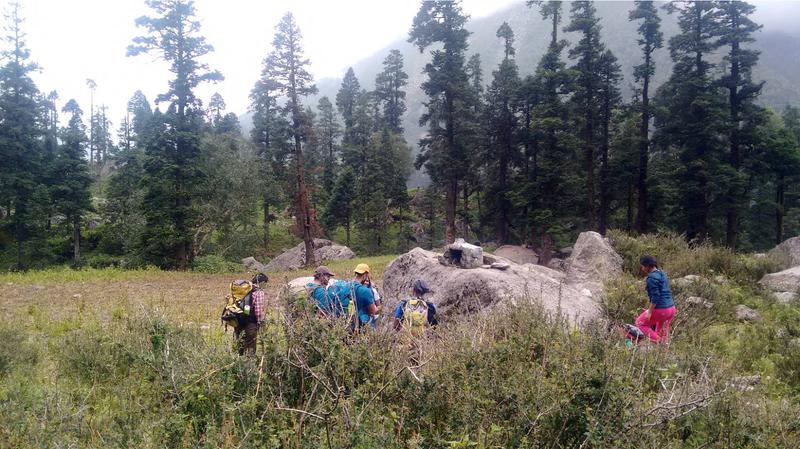 and the trek would definitely be a longer one, and us novice trekkers weren't cut out for it. However, our back up plan -Maninda lake, turned out to be the cherry on the icing that day! It was chilly as usual but as we reached the lake, a vast open land of calm waters and the purest air, it started to get warm. What warmed us more was breathing in the fresh air as the Himalayan birds sang in glory of the lake! It felt surreal, like we were in another part of the world and for some of us who meditated and/or enjoyed the quietude strolling around, the experience was definitely one of a kind. While some of us built as aura around ourselves here and refused to move, some of the hikers wanted to explore me. So Vijay, Sudesh and Veera took a diversion and explored more around the area. After the short trek, we basked under the warm sun for a few hours, lunched and watched the sun set and as the cold breeze streamed in. I must say, Veera did an excellent job tweaking the original plan, thanks to him, we got a few hours to sit by the river and spend an extra night midst the mountains. Neil sponsored a session in bouldering that evening, but there were only a couple who could succeed as the clouds set in and it poured. Nestled in the dining tent that evening, we had Neil perform for us instead. It took a lot of convincing for him to dance for only a couple of minutes, but that was quality entertainment! Probably the best weather in the week, it felt like we had stepped out of a catalogue that day. 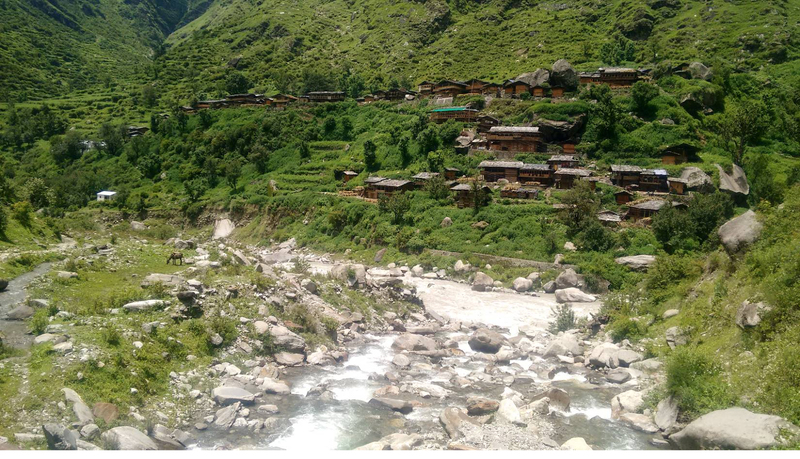 Sun kissed skin, essences of spring in the air, a delightfully roaring river, bidding aideu to the mountains was perhaps harder than the trek to Osla! Rahul prepped a special pancake breakfast for us and personally, it was having it in the open fields that made it more delicious. 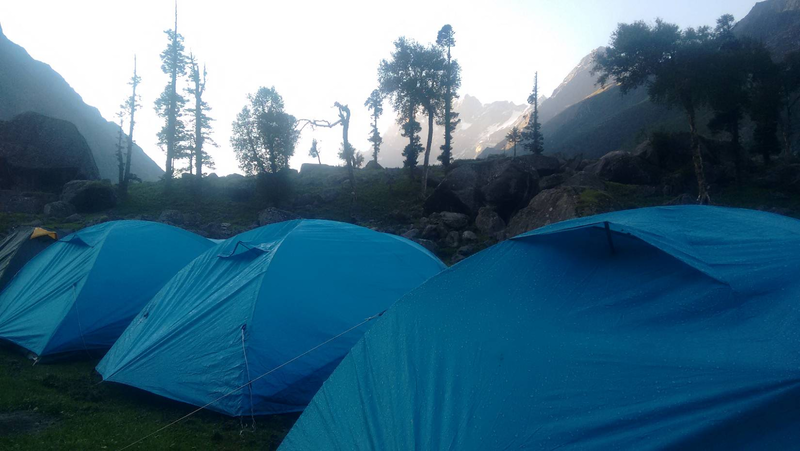 Tents unpitched, rucksacks packed, laces tied, we were ready to descend. 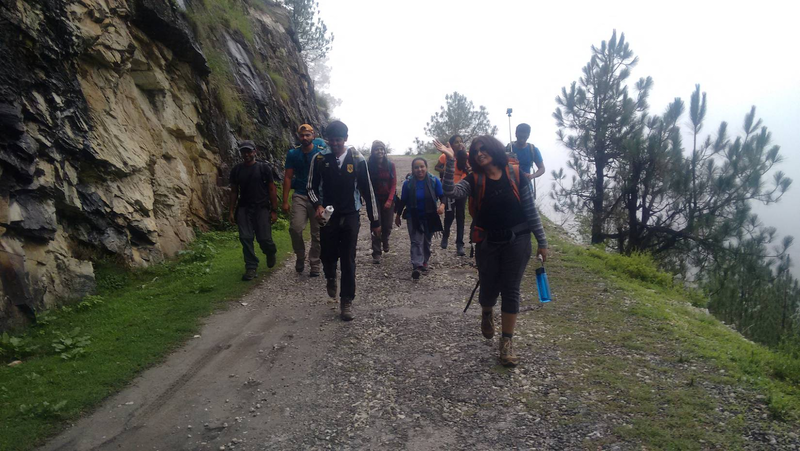 But, Sushma suggested that we all sing the national anthem before we start and trek and hmm.. that was another experience! For must of us, it was over 10 years since we sang it out loud, but the resonating verses did give us a sense of patriotism. Again, I wish I could explain the weather here, but words cant do it justice. The descend was a lot more scenic as we got clear views of Bandarpoonch, majestically flying eagles, more flowers and more fruits to munch on. Our lunch stop was at a shack in the middle of nowhere, where we cut cake to celebrate our journey while Nimbus and Akira continued to entertain is with their indolence and greed for food, respectively. Taking a route on the other side of river Seema, we got to cross a 70 year old bridge where we stopped to admire the river and the mountains one last time. With Dinesh as our foraging guide, we were able to get our hands on some of the most delicious raspberries, strawberries, local fruits called chilly and tawto. Engrossed in foraging, the bunch of us in the end almost missed the signs of a downpour and our dear leader Veera struck a tone to rush us to the camp site, which was only metres away. The minute we set foot in the dining tent, it started to pour! Ok, I guess an apology and thanks is in order, Veera. As soon as we loaded off the rucksack, we pitched our tents by ourselves and took a breather before assembling for tea. While we sat playing a game of Mafia, the water seeping in through the tents went almost unnoticed till someone realised those were the sleeping bags we were to sleep in. In just a few minutes, we untied the bundle distributed the sleeping bags, rushed to our tents, dumped it and assembled back in the dining tent. All this happened in a span of ten minutes, but some of us did end up a little drenched. The evening continued with more uno and mafia till dinner was ready. Mixed feelings seeped in as we unpitched our tents again. It was coming to an end. Every minute counted today and each one of us spent it in our own way- some starting conversations, learning more about the crew (this is when we learnt Jogindher is a romantic and a poet), some enjoying the silence, meditating, clicking pictures, playing with the dogs. The route back looked slightly different. Could be the rains or just that gut wrenching feeling inside reminding us that we will have to breathe in unfiltered smoke and air again in a few days. We stopped at the same spots as we did earlier, but our honed foraging skills led us to bushes loaded with the most delicious BLACK RASPBERRIES, some version or juniper berries (I think). As we reached Taluka, the cheers got louder and YES, that was the last path to be covered by foot. 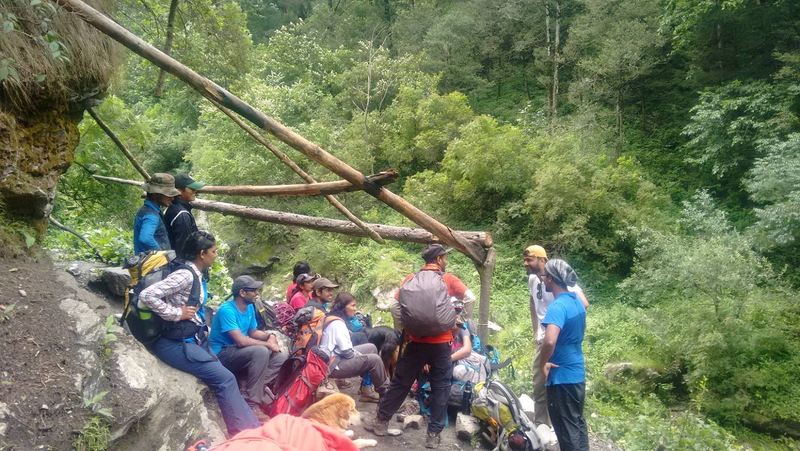 Done with the trek, we just started to flex comfortably, hoping that the our aching muscles would start to rest immediately. Well, the inverse happened! 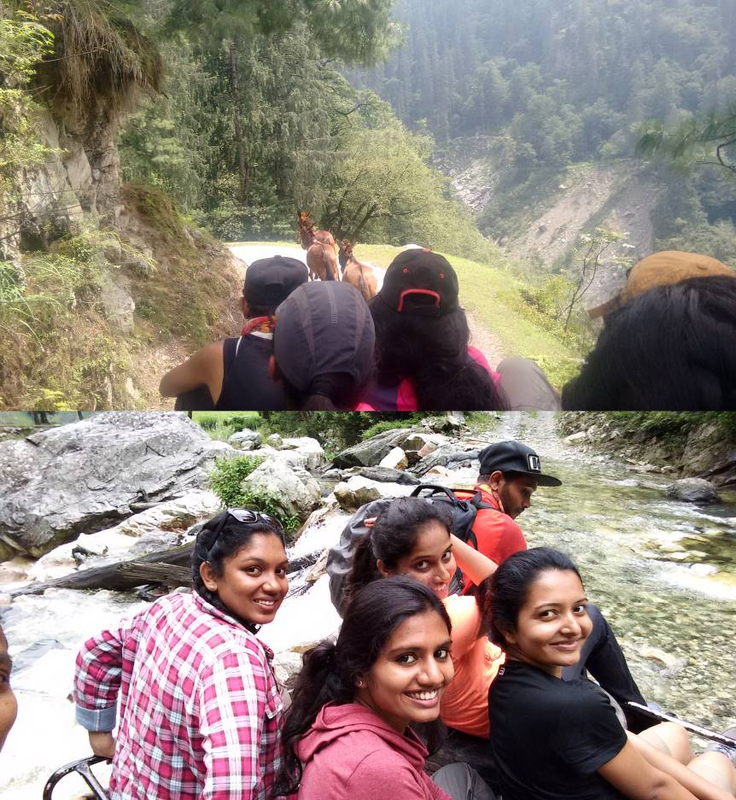 We opted to sit on the top of our MUVs which ploughed through narrow, bumpy roads, over pebbles, rocks and across waterfalls. This 45 minute ride to Sankri put all roller coaster rides to shame, for some that was an experience. There ends our journey to Sankri. 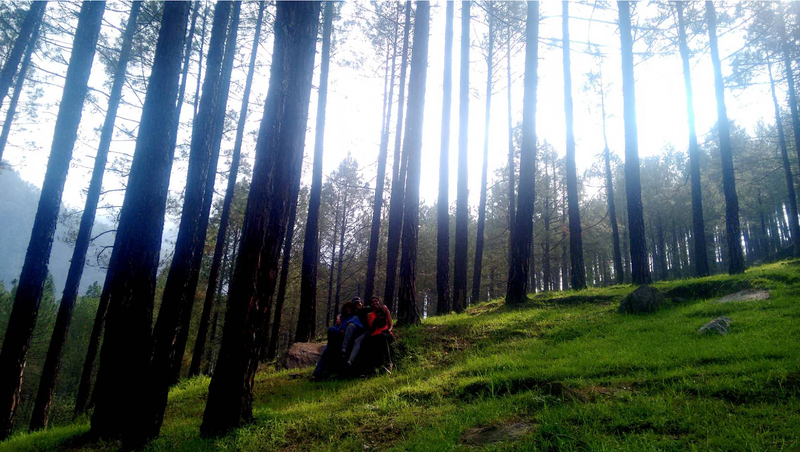 The journey back to Dehra recapturing the beauty of pine forest way back. The next day it was back to Bengaluru. Home, alas! Like Tagore narrates in a poem, there is no other happiness than observing a dew drop on a blade of grass in your home garden, even after you have trekked across the globe. Yet, the humble mountains are calling again, they will always.